Primary Rainbows we see all of the time.These are the normal red to violet arcs that we see after it rains. SecondaryRainbows are the rainbows that are reflected twice inside of the rain drop.They have the colors reversed and appear next to the primary rainbow. 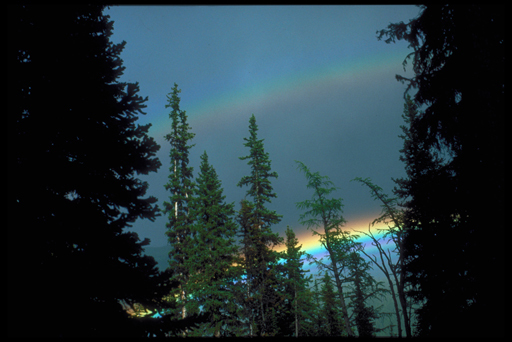 Spurious or Supernumerary bows are faint color arcs that sometimes seen next to the primary or secondary bow, due to interference. In this picture you can see the supernumary as the blue hue underneath the bright primary rainbow. 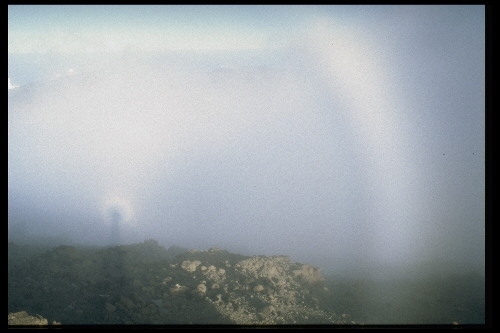 Fogbows or white rainbows arepale circles of light that are sometimes seen in clouds and fogbanks. Lunar Rainbows are formed when the moon emits white light that raindrops can refract and reflect into the atmosphere. Moonlight is much fainter than sunlight so a lunar rainbow is not very bright. This also appears as a white arc because we lose our light sensitivity at night so we cannot distinguish color. -Red Rainbow-occur at sunset, light travels a far distance to reach the waterdrops, by the time the light reaches the rain drops the blue end of the spectrum is lost or scattered and only red light emerges from the rain drop forming red arcs of light. -SpiderWebRainbows-dew-covered spiders webs may show fragments of rainbows. -SurfBows-this occurs at the beach. -Roadspraybows-the sprays from car tires that pedestrians try to avoid. -GeyserBows-Have you ever seen Old Faithful go off in Yellowstone National Park? -Mistbows-you can see these from your garden hose.